Losing your database can cripple your business. How do you ensure that packages have been sent to the appropriate delivery addresses if you lose your tracking information? How much longer will it take to finalize sales if your team has to revert to paper-based transaction records? How will your healthcare facility properly administer medicines to critically ill patients if you don’t know what drugs they are allergic to? Keeping backups in-house may be good protocol, but it is generally infeasible for small- to medium-sized businesses. Note that regularly backing up your data to ensure they're up to date may result in ballooning data storage costs. 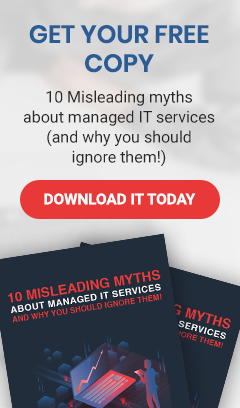 Moreover, it takes expertise to determine what needs to be backed up in the first place — amateur technicians will have you copying entire databases every time, which is unnecessary, time-consuming, and potentially disruptive to business operations. Additionally, disaster recovery experts know how to do failovers and failbacks in a manner that is not disruptive to your operations. They’re adept at diverting processes to use backup data, and also reverting back to normal processes once the data loss event is abated. More and more states are coming up with their own data-related regulations, with California as one of the pioneers. At the federal level, the Dodd-Frank Wall Street Reform and Consumer Protection Act covers the financial services industry, while the Health Insurance Portability and Accountability Act protects the privacy and availability of patients’ health information. Many of these regulations include clauses that require businesses to have disaster recovery plans in place, especially for industries where access to data can mean life or death. Having disaster recovery experts who have compliance specializations in your industry will help you avoid any legal trouble down the line. New methods and technologies change how businesses are run, thanks to faster internet speeds and exponential growth in computing power. Progressive companies enable its staff to render remote work via mobile devices, and cutting-edge manufacturers use the internet of things (IoT) to manage production with the least amount of human intervention. All of these bolster productivity, but since they connect to the internet, they widen the surface area that must be protected from cyberthreats. The risk of a successful breach can never be completely eradicated. Moreover, ransomware can hold your data hostage. Viruses can turn information into misinformation. And cybersaboteurs can wipe out entire databases because of a grudge or a whim. Regardless of the form it takes, data loss can be disastrous for businesses. This is why it's imperative that you work with true disaster recovery professionals who can offer you their expertise on cybersecurity. They can efficiently trace data leaks, keep infected areas quarantined, and implement higher cybersecurity safeguards, all of which are important precautionary steps prior to initiating data recovery. You certainly don’t want your backups to fall prey to hackers as well. Don’t let data loss be the disaster that shutters your business. Contact us to learn more about how our disaster recovery experts at USWired can future-proof your business.